This is our new product for our Daz 3D store: EJ Nina and Ella for Genesis 8 Female is a character that includes 2 alternative shapes for head and body: EJ Nina is a beautiful dark skinned model, and EJ Ella is a more curvy shape. The textures that you can use with Ella or Nina include many possibilities from casual to Ancient Egyptian, fantasy warrioress, pinups, top models or common people. 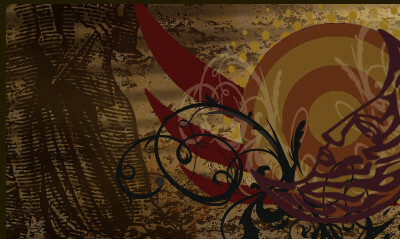 You also have 5 skin tones to get different looks as African-American, darker skin, African ebony, Brazilian or Egyptian. This is our new product for our Daz 3D store: Juliet Outfit for Genesis 8 Female(s), a two piece short dress with boots and poses for Genesis 8 Female(s), that also includes 10 poses. It comes with many full material presets and partial materials to choose the top or skirt you like more, the rings metal and the boots material. 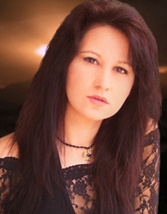 You can also use its style morphs to make it more bold and short or more elegant and long. 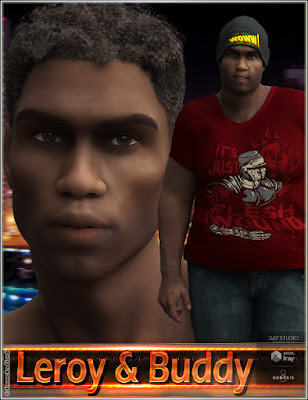 This is our new product for our Daz 3D store: EJ Leroy And Buddy For Genesis 8 Male is a character that includes 2 alternative shapes for head and body: EJ Leroy is a muscled ideal model, and EJ Buddy is a more stocky shape. The textures that you can use with Buddy or Leroy include many possibilities from casual to tribal or deities of the dead like the Loas, top models or common people. You also have 5 skin tones to get different looks as African-American, darker skin, African Ebony, Brazilian or Caribbean. This is our new product for our Daz 3D store: Independent Girl Mix and Match Expressions for Stephanie 8 and Genesis 8 Female(s). 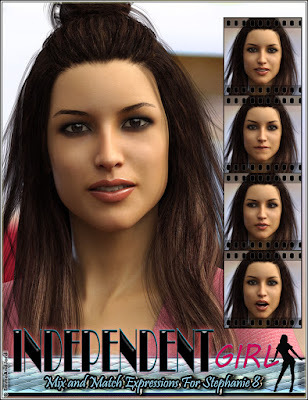 Independent Girl is a pack of expressions organized in three folders (Full Face, Upper Face, and Lower Face) for Stephanie 8, and you also have pose control ERC dials to apply each full face expression. This is our new product for our Daz store: Sabela Hair for Genesis 8 Females is a long half up bun hair that looks amazing in any female character. Sophisticated and wild, feminine and messy, is perfect for casual, top fashion, sci-fi and fantasy girls, warriors, or whatever you can imagine.